Home / Articles / Are You An RX Athlete? Are You An RX Athlete? 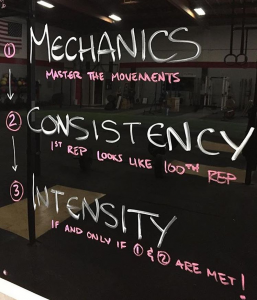 So you’ve learned the 9 fundamental movements of CrossFit this gives you the basics of all lifts. Next goal? Good, I like your thinking – CONSTANT progression. Now how to act on your goal. The RX weight is 45kg for men and 30kg for women. Pull ups should be completed without assistance – preferably with a gymnastic kip. You need to perform both of these movements with the stated rep scheme within 7 MINUTES or RX is not achieved – no biggie if you can’t, we can SCALE! Cannot perform RX weight for more than 10 reps unbroken? Scale the weight down. Cannot hold the bar in a comfortable front rack position? Scale to Dumbbell! Strict, gymnastic kip, butterfly kip are all RX. Cannot perform the above? Let’s try a band off of the rig but please keep your banded pull ups STRICT – kipping with a band is erratic and wasting your time! Ring rows are an awesome scale. But if you want to target your lats more like a real pull up here’s how; Elevate the rings, pull your hips underneath your shoulders now pull – Ring pull ups with heels on the floor. Repetitions will be kept the same as will the time cap so you’re working at the same intensity as everyone else in your class! If the DUMBBELL SNATCHES take more than 3 minutes to complete then the weight is too HEAVY – This should take LESS than 2 minutes, any longer then we’re losing the INTENSITY aspect of the workout. After your 1st round sure enough the CONSISTENCY of the reps will deteriorate causing you to finish well over the time stated which has now changed the objective of the WOD or will lead to injury through poor MOVEMENT. Use the beauty of CrossFit. Don’t be afraid to scale but also don’t rely on it – strive for constant progression in every workout you do, this can be going heavier, aiming to finish more rounds in an “amrap”, finishing faster “for time”, maintaining sound technique throughout a lift or beating your friend in a WOD. Listen to your coaches, do daily mobility and eat your vegetables!